If we didn’t know any better, Kenji Shinagawa could have written that extremely catchy ditty that used to play over those older iPhone commercials…You know, the ones right before your late June and early July were both ruined by waiting in line for an iPhone. And it’s not a bad thing, as Kenji’s first album, Perhaps, Drawing Again, is made up of 9 unique, yet familiar, songs that remind you of something wonderful that’s just beyond the grasp of your memory. Starting on Friday, November 7th, Kenji will be playing a few shows, kicking things off at Spike Hill in Brooklyn at 8:00pm. There’s no charge so be there or be, uh, square. (Is there a replacement saying for that yet? We feel so…square for using it). But wait! The Kenji-goodness doesn’t just stop here. Head over to I LOVE Your Clothes for some photos so you can tell him how much you LOVE his jacket when you see him at his upcoming shows! Kenji Shinagawa: Hmm. I think it would have to be MF. I just don’t like the sound of it. I know Samuel L. has made a living by saying, MF this and MF that, and he’s a very funny guy, but it’s not for me. I’ve heard it used in a complimentary way, like “Man, that Coltrane. He’s a bad MF.” That’s slightly more tolerable, I suppose. YIA: Marry, sleep with, kill: Ichiro, Hideki Matsui, Daisuke Matsuzaka? KS: Wow! What a question! I was not prepared for this. I’ve played this game before, but usually with girls I like. Where do I begin? I guess I’ll start by giving Daisuke the kill. Only because he has become Ichiro’s nemesis, and although he helped Japan win the inaugural WBC, I can’t say that I root for him much. The big question is, where do I put Ichiro? He has always hovered in the top of my list of people I’d like to have lunch with one day, but would we be compatible to spend the rest of our lives together? I’d have all these questions for him, like how often he gets his hair cut, and if he would experiment with his hair more if he didn’t have a profession that required him to wear a hat and a helmet all the time, and what he thinks of Iwamura’s mohawk. But seriously, I sweat him. Remember that word from the 8th grade? Maybe it’s odd that I idolize a baseball player so much when my thing is playing music, but he has all these great philosophies and approaches to the game that can apply to anything, especially things that involve craft and years of concentration. A bunch of these qualities he has, I strive for in music. He’s got a very unique style, he has this ability to create excitement, and he understands and feeds to his strength. I would love to… oh, what? Oh, yeah…what was the question again? YIA: A lone, solitary chair, a shadow cast from an unknown and unseen light source, drawing again, maybe, perhaps, sort of. What’s the deal with that? KS: When I started gathering pieces for the overall concept of this album, part of it was that I was revisiting my childhood. When I was a kid, before I played music, I used to draw quite a bit. In Japan, where comic books are a way of life, I used to even write my own comic books. “Drawing again” comes from visiting that innocence and the youth. I don’t want to give too much else away, because the beauty of all this is that it’s up to the listener’s interpretation. I like it when people come up to me and say, “I really like this song by you. Is it about this? Because that’s what I envision when I hear it.” Many times, it’s not what I had intended for the song to mean, but I think that’s the neat thing about art and music. Other times, a listener will tell me that one of my songs reminded him or her of something, and it is exactly the vision and the sentiment that I had intended. When there are no lyrics and that happens, I take off like a rocket. YIA: Why do you have the perfect name? KS: You really think so? I’ve really grown to like my first name over the years. It sort of sounds like a nickname. It also works well in Japanese and English. I’m very lucky in that respect. I like my last name too, but sometimes I think about coming up with a moniker for myself as an artist because it’s long and difficult to remember. I thought about just going as Kenji. Did you know Shinagawa is a train station in Tokyo? No, we didn’t, but we do know that “gawa” means river! See, not only do you get an interview with a cool fella, you learn too! YIA: Where can we find the best Japanese food in any place that’s not Japan? KS: In my mom’s kitchen. Her cooking is incredible. She can do some gourmet, but it’s her homey flavors that really do it. And the variety. These days, when I go home, a normal meal consists of about 2 or 3 of my favorite dishes, plus a few small side dishes, and maybe even soup. It’s amazing. In my book, she would rank at the top in Japan or in the U.S. My mom and my grandparents are the reason I am a foodie. YIA: Why do you think Think Coffee has the heat turned up so high in the store? KS:I never noticed that. Maybe I’ve only been there in the summer… oh. Think Coffee. November 21st. 9PM. Be there, or be cold. Editor’s Note: The heat issue is absolutely nothing against Think Coffee; we love the place! It’s not just hot in the literal sense, but hot in the Paris Hilton “that’s hot” (by gumdrops, WHY oh WHY did she get to appropriate that phrase?!) sense. YIA: Would you rather play only ukulele for the rest of your life, or always play a guitar with the G-string missing? KS: I really adore my uke. That such a small instrument could give my fingers so much enjoyment. But, I would definitely choose the guitar with a missing string. The guitar has been with me for what feels like my entire life, and I’ve spent way more time with the guitar than I have with any other person in this world. The guitar is a big part of how I identify myself. Even if it’s missing a string or two, I’ll figure something out. It’s rare for me to go a day without spending time with one of my guitars or now one of my other stringed-instruments. 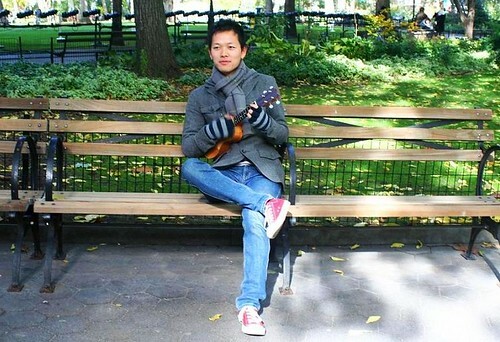 I actually bought my ukulele before I left for my trip back to Japan earlier this year. The trip was almost two weeks long, and I thought I would really miss my guitar for being away for that long, so I bought a ukulele as a compromise so I can travel easily with it and have something to play with. YIA: What’s the best analog noise in the world? KS: I don’t know if I have a favorite, but I’m in love with the noises that my Maxon analog delay pedal makes. With a couple of tweaks of the knobs, the pedal will go into this oscillation mode. The pitch, then, can be controlled by varying the time of the delay. I find the resulting sounds very emotional and strong to the senses. I find the analog delay to be generally warmer and more life-like, and that’s why I bought this Maxon several years ago. It costs about two to three times that of their digital counterparts, but I can’t sacrifice sound. This whole oscillation thing came as bonus to me when I discovered it while playing around with the pedal. It has become some of my favorite effects, and I like that it doesn’t sound like your usual guitar effect. You can hear it on A Song I Thought I Heard and little bit on Still Frame. YIA: What’s the best thing about food? KS: When it’s tasty, it brings me joy! Food also brings people together. Family meals, pot lucks, dinner dates, BBQs. Food has always been a big part of my life, and it always will be. I look forward to dinner everyday, and it’s tough for me to go to bed without a satisfying meal at the end of the day. By the way, my favorite food from my childhood: Tako-yaki! ~ by youisawesome on November 4, 2008.
whoa. i really like his stuff!